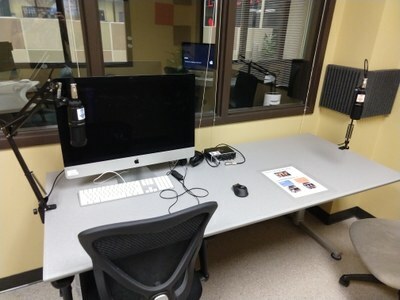 The Digital Media Suite houses three studio spaces designed for high-quality audio and video recording and photography. 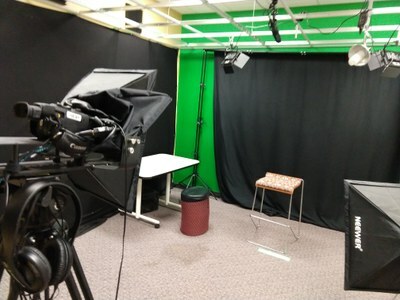 This space is provided to support students, faculty, and staff in the creation of audio, video, and images for academic purposes. Supported by the DMS staff, this studio space is available during our regular hours, and it can be reserved using our online system. 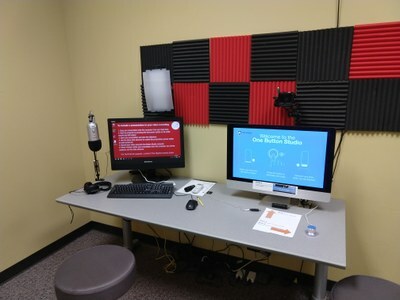 This space provides support for the creation of audio recordings. This includes podcasts, video voiceover, narration, etc. The One Button Studio is an easy to use video recording space that requires no special knowledge or skill to use. Press the button to start and again to stop the recording. Remove your flash drive when the computer prompts you to. The One Button Studio also includes a high-quality podcasting microphone connected to a computer for Panopto or audio recordings.